A phone call from my uncle Jim Greer started me on a surprising journey through Odd Fellows Hall history. He told me a story about Fred Schleifer who used to bring his wife Alodia to church in the late 1930s. Since Fred was not a member of the Aurora Branch, he was more interested in the car dealers on South LaSalle Street than in church meetings. Jimmy recalls that one Sunday Fred bought a Hudson Terraplane. 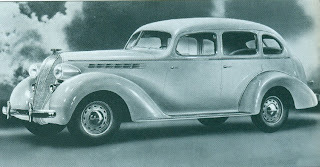 Possibly a better candidate for Fred’s car is this 1936 Terraplane Custom touring sedan This car weighed 2,875 pounds and cost $740. Fred needed a good car because he had to drive to work from his home in Kaneville to Montgomery, Illinois, a roundtrip of 30 miles. He worked at Lyon Metal with James T. Greer, and it was because of that connection that he met his second wife, Alodia Howard, which took him to LaSalle Street and the car dealerships. Jim Greer’s first job at Lyon Metal was making shipping crates. A look at the 1930 census shows Fred Schleifer doing exactly the same thing. Obviously they struck up a friendship because Jim Greer never met a stranger. Fred was 48 years old, to Jim’s 34. He was born in Pennsylvania and he had a wife and three children living at home. Sometime in the next five years his wife passed away. Meanwhile, Alodia Howard moved to Illinois from southeastern Idaho after her husband was killed in a mine explosion. He had belonged to the Moose Fraternity, and so his widow and three children (Lynn, Wallace, and Georgia) were eligible to live at Mooseheart, the “Child City,” a few miles north of Aurora along Route 25. From the Mooseheart website, we learn that it is “a home for children and teens in need, from infancy through high school. Dedicated in July 1913 by the Moose fraternal organization, MOOSEHEART cares for youth whose families are unable, for a wide variety of reasons, to care for them. Some have lost one or both parents; others are living in environments that are simply not conducive to healthy growth and development.” Alodia Howard found employment at Mooseheart and the children lived in the cottages. It wasn’t long before James T. Greer decided to introduce Fred and Alodia to each other, and the rest is history. As I said at the beginning, the story of the Terraplane started me on a journey that uncovered some unusual facts about South LaSalle Street and the automobile businesses that grew up next to the Odd Fellows Hall. Keep checking back. There’s more to this story. When I watch some of these old cars, I sometimes wonder were did go all the creativity and all the cool things they do to cars.